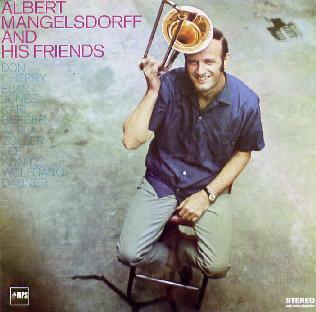 Albert Mangelsdorff - "And His Friends"
All tunes represent improvisational duos, and this means Albert Mangelsdorff on trombone together with trumpet, drums, vibraphone, guitar, alto sax and piano played by the likes of Don Cherry, Elvin Jones, Karl Berger, Attila Zoller, Lee Konitz and Wolfgang Dauner. If you know a little bit of Albert Mangelsdorff’s personality and his way of playing, you will agree immediately when I say that it’s definitely not a "trombone plus ..." album that’s featuring a "star" and his "sattelites" on different other instruments. Each of the tunes is a very personal and in some cases even intimate conversation between Albert and his musical mates who perform at the same level of excellence. This is complemented by Mangelsdorff’s unique ability to let a trombone not only sound as a trombone but also as a trumpet, a saxophone and even as an upright bass, which lets the whole set of tunes sound even more varied. What about the content of the mentioned "conversations"? "I Dig It - You Dig It" - based on Terry Riley’s composition "You Dig It" which was originally performed by Riley together with Swedish children - is a very humorous chat between Albert and Don Cherry including moments with both of them singing (!) the basic melody, and the "fade out" of Don’s part is reportedly due to his dancing out of the studio door still playing... On "My Kind Of Time", performed with Elvin Jones on drums, you a get a free interpretation of playing "time" in Jazz with Elvin playing quite melodious and sensitive at times and Albert contributing percussive elements played on the trombone. "Way Beyond Cave" together with vibraphonist Karl Berger is the most personal and honest contribution to the CD reflecting two completely opposite personalities who’ve taken quite different ways of becoming world stars of the Sixties Jazz scene that both have started in the Heidelberg students’ Jazz club "Cave" (which still exists today as a students’ club, rather not as a Jazz venue) where they had frequently been playing at the beginning of their carreers. "Outox", performed with guitarist Attila Zoller, in contrast exhibits a picture of rather like personalities who almost seem to present a pre-composed tune aptly described as "a duet full of the mature sensibility existing between these two musicians whenever they play together" in the producer’s original liner notes. If you can describe Albert’s and Attila’s contribution as a work of close friends, "Al-Lee", performed with Lee Konitz on alto saxophone, might be considered as a "work of brothers". You almost can’t tell which of them is playing what, and it takes them just a little over two and a half minutes to tell the whole story of Jazz from beginners ambitions in obscure cave bars to the fashionable and mundane New York City style Jazz of that time, it’s simply perfect. The CD closes with "My Kind Of Beauty", together with Wolfgang Dauner on piano, an almost "intellectual" tune on one hand and beautiful romanticism on the other. You get all this in a digipack with a reproduction of the original LP cover, pictures from the recording sessions and the original liner notes by Joachim-Ernst Behrendt, and remastered in a sound quality of almost unbelievable magnificence. It’s obvious that the target group of this CD are collectors of rare Jazz recordings but beyond this I’d like to recommend it to everybody who likes hand made and honest music from a time when it still was possible to get worldwide acknowledgement when you "simply" were a good and ingenious musician (which was 35 years ago, I know). If you happen to be an improvising musician yourself, not only in the Jazz genre, to know this record will enrich your musical life if not even give it a different direction.